My obsession, a 1934 Chevrolet Master Sedan. 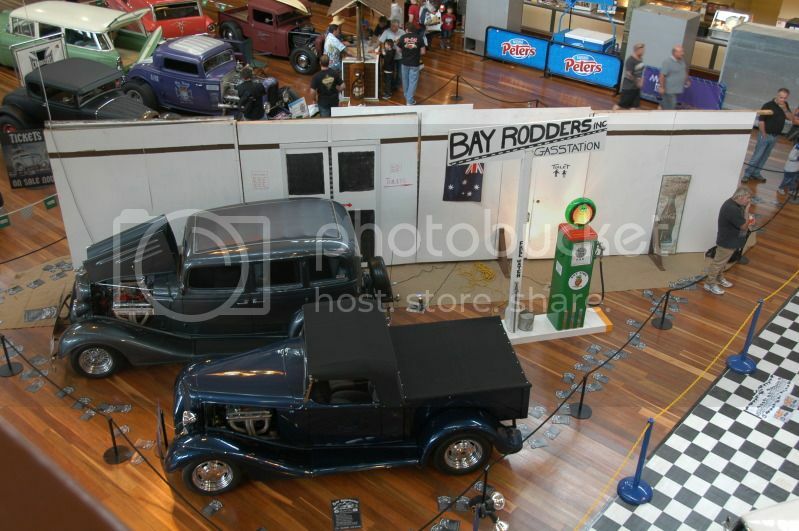 There's more details on the Bay Rodders members pages. That little blonde headed bloke is now taller than his old man! These pages are dedicated to all those dudes out there who go out to their garages, night after night and all they see is a big pile of rusty twisted tin and oily, greasy parts asking themselves "What am I doing this?" and "Is it all worth it?". And to all those other guys and gals who have to balance family, work, financial commitments with their passion for owning, building and driving a hot rod. Its also a story about building your first rod and all the mistakes you make along the way. The "why" part, I'd have to say has changed over the years. Originally it was a desire to have a Hot Rod as an object, something different. Now I'd have to say it's almost a state of mind or a lifestyle thing. It's also very much about the friends you make, the places you go and the people you meet along the way. 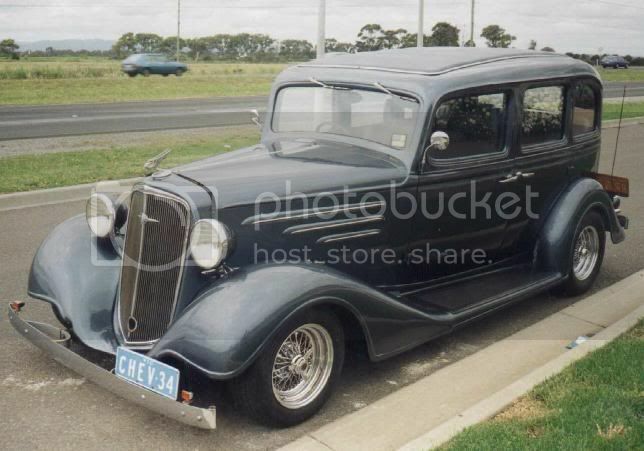 I've been a GM man all my life, I suppose I inherited that from my Dad who had always had Holdens (Aussie GM), so when it came time to look for my first Hot Rod, it was always going to be a Chevy of some sort. I decided early on, that to my mind, the '34 was about the best looking early Chev, so that part was easy. When your building a car from the ground up, there are just so many choices to agonise over : - bodystyle, year, resto rod, hi-tech, hi-boy. The list goes on and on and that's before you start to think about colours or trim fabrics. I had been looking at various cars all over Victoria (my home State) for about 2 years, scouring all the papers and magazines, all the time, in the back of my mind I wanted an original car to start with, something that I could really call my own. But even in those days, good tin was hard to find. As originally towed home, I'll have this on the road in no time! This paint scheme was years ahead of its time, long before Disney released 101 Dalmatians. Look at all those spares. Now that's what I call Hi, boy! What I had purchased was a complete car, all the panels, trim and molds came with the car along with some spares, and for anyone who has ever spent any time looking for that illusive part, this was a bonus. However it was an unfinished project, at the time I thought this would work to my advantage, as it would reduce the build time and get me on the road quicker, how wrong could a guy be! All the engineering in the chassis was early seventies, and as I was latter to discover the construction left a bit to be desired. Note unusual inner chassis rails and the dip in the rear cross member. When I got the car home, the first thing I did was tear it to pieces and it was only once I lifted the body off I realised just what I had bought, the car sat too high, so the rear crossmember was always going to come out and it had virtually another set of rails running under the body, why, who knows. The front end was HR Holden, but the chassis rail sat on top, so it wold have to be modified to get the front sitting right. Mmmmm, looks like a complete rebuild! While I still had the body on the chassis I took it around to a few of the shops to get quotes and some ideas. Eventually I settled on Moonshine Motors in Upper Beaconsfield, it was also handy to where I was living at the time. It took six guys to unload the bare chassis off the trailer and into the shop, as we were to soon find out, who ever had done the previous fabrication on the chassis, had just picked up what ever was lying on the floor and welded it in, there was about 5 different thickness of metal in the chassis boxing! Eventually we ended up with just the chassis rails and the fuel tank cover from the original project, everything else was new or redone. After all the fabrication was done, it was back to PM Panels to prepare the chassis for some BMW Black Glazzurit 2 pak. All the running gear was detailed as well, smoothing and deburring, it too also got a coating of Glazzurit, this time it was Italian Red (a Ford colour). The body work was also started at this time and new hood bows installed. Note the body still retains all the original wooden frame! A new steel floor was made up. Which consisted of a 1" box tube frame with 0.25" steel sheet top and bottom filled with foam. This also has conduits for all wires to the back of the car running through it. After the show the car went into storage for about 18 months, then when time and money permitted some of the fitting up commenced. Things like the headers and exhaust. Running all the pipes and lines, then finally paint. The colour is called Venitian Blue, it's a Porche colour (Paint Code 35U). I like it 'cause it's blue and it shows off the chrome well. We were lucky to be the last car to be sprayed that day so the paint cured overnight in the booth. The body was placed on a dolly with all the hang on panels placed in their approximate positions on stands. To both the credit of the paint (Glazzurit) and the painter, to this day the body has never been polished and apart from the usual chips and scratches after nearly 10 years, it looks as good as new. There was a concerted effort to get the Chev presentable for the '90 Victorian Hot Rod Show. It was a close thing, as is the case with most projects of this type. Midnight the night before I was still putting the fabric roof and those one hundred and one other little things that needed to be done. But we made it and once again on a permit, I drove into the Exhibition Buildings. On the way home after the show it was very hot and I stopped to check the water temperature, as I was putting the bonnet down with the engine still running, I managed to catch my fingers in the fan blade. Didn't feel a thing. After a little bit of microsurgery and 6 months of physio I was ready to get back to work and finish off the car. If I had my time over again would I still do it? You bet, only not quite in the same order. And to answer that question I asked at the start; is it all worth it? Yep.